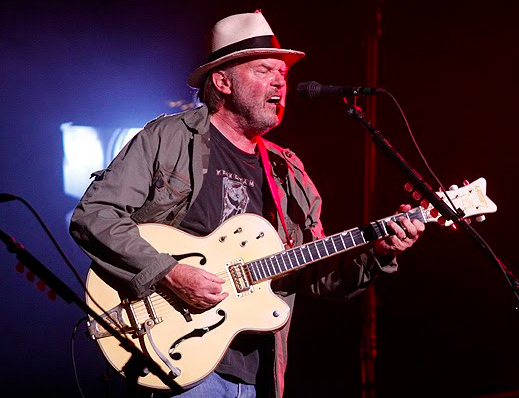 Neil Young has used a number of Gretsch White Falcons over the years. While with the Buffalo Springfield, Neil had a 1959 mono White Falcon model 6136. This guitar had two switches on the upper bout and a Bigsby B6 tailpiece. Sometime In 1969, Neil traded his mono White Falcon to Stephen Stills for a 1961 stereo White Falcon 6137. The stereo White Falcon has four switches on its upper bout and two tone controls below the bridge. Neil’s version has a non-standard Bigsby B7 tailpiece and has had its pickguard removed.